'Everybody can make music. Everybody can compose, somehow. When you want to teach children sports, they play football, or get given a tennis racket, they don't simply watch. But when we want them to be involved in music, we ask them to sit passively. This is surely not the right concept' - Simon Rattle tells it like it is in today's Observer, in an article about the Berlin Philharmonic Orchestra's dance project with marginalised children. How true, and I read those words while still on an emotional high from making music for the first, and probably last time in a Britten performance in Snape Maltings under the baton of Stephen Layton. Tomorrow (December 4th) is the thirtieth anniversary of Benjamin Britten's death. Last night I was at a performance of his cantata St Nicholas as part of Aldeburgh's Britten Weekend, and my music making was a vocal contribution to the two congregational hymns in that wonderful work. They may only be congregational hymns, but the audience were given the sheet music, and in a pre-performance rehearsal Stephen Layton even reprimanded us for not observing the pianissimo marking for the first entry of God Moves In A Mysterious Way. What an uplifting evening. Not just for the communal music making of almost one thousand voices celebrating Britten's genius, but also for Aldeburgh's continuing commitment to nurturing young musicians. Specific praise goes to the exquisite performance of the Ceremony of Carols by the high voices of the Choir of Trinity College, Cambridge, and the contributions of the young harpist Sally Pryce and the outstanding young tenor Allan Clayton who sung Nicholas, surely a star in the making? The full programme is given below, and the first half was performed as a continuous sequence, without applause. It ended as the bell tolled for the last time in Arvo Pärt's Cantus in memoriam Benjamin Britten with the capacity audience holding their collective breath and the bows of the Britten Sinfonia violins frozen in mid-air. A moment of sheer musical, and emotional magic. But my special Britten champagne moment came even before the music started. To the side of the Snape auditorium is the box that Britten and Pears created for themselves. To call it a box is too grandiose term, it little more than a slit in the raw brickwork of the Maltings. The boy soloists for St Nicholas watched the first half of the evening from Britten's box. Before the concert started the four very young trebles from Ely Cathedral Choir, immaculately dressed in school uniform, leant over the front of the box laughing and waving to friends in the audience. It was a pure Britten moment. Their faces radiated youth, exuberance, total innocence, and above all a dazzling hope for the future. 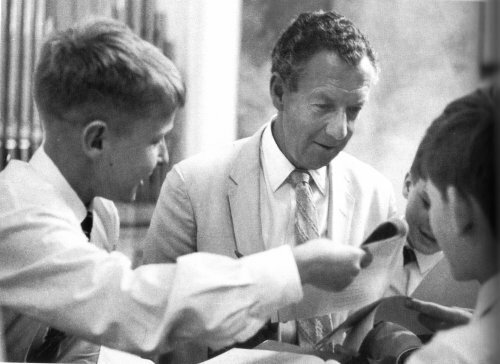 Header photo shows choristers of Coventry Cathedral with Britten in rehearsal for his War Requiem in Ottobeuren Basilica, West Germany in 1964. Comment posted to my Music will rise from the wreckage article by Charles Noble but worth reproducing here, and do follow that link to Charles' blog. I had the pleasure to take part in a master class at Snape, Maltings back in 1993 with Kim Kashkashian. It was a magical experience, and the landscape of those lovely waterlands which surround the place being a large part of it. The ghost of Britten really does inhabit the whole of the area, from the Peter Grimesian burg of Aldeburgh and the old buildings of the maltings. Thanks for giving some wonderful history to us. Though I'm not a churchgoer, I dropped into an Advent mass at a small, old Episcopalian church in my neighborhood in San Francisco this evening because a friend was singing as a soloist and they were featuring an amazing mix of Palestrina, Britten and others for an 8-person chorus mixed in with congregational hymns. It was exquisite, and I finally got a complete glimpse of the musical genius of Britten in his attempt to bring music to a wider community through the church (in his parables, Noye's Fludde, Saint Nicholas and so on). I envy you your experience. And someday I'm going to come visit Aldeburgh and its new music school and document the whole place, in which case nothing would make me happier than running into you, Mr. Pliable. Thanks for the pics and the info. Ships in the night Pliable. I didn't have the pleasure of a concert in The Maltings this weekend, but I did get to see a Winterreise at Aldeburgh's Jubilee Hall - co-incidentally sung by Stephen Layton's right hand man-elect at Trinity College, Cambridge, Thomas Guthrie.